I have already told you that I like very much Michael Quach for his applications designed for iPhone, iPod Touch and iPad and I have already presented 2 of them or even more, only that I don’t recall what were those apps, on another site where I write about apps, which is iphonekicks.com. The previous app presented by myself was Health Facts, a free application that refers to all sorts of interesting facts that have a connection to medicine. This is why the application I have selected for today is also related to health, only that to a certain part of the medical domain, which is nutrition. If you know the apps created by Michael Quach, probably you know the application about which I am about to talk: Nutrition Tips. This is a free application, included in the Health & Fitness category in the App Store. 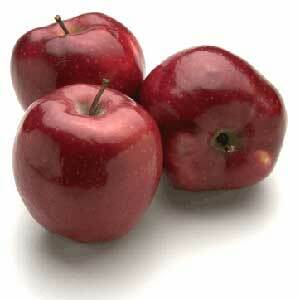 This application has been updated on August 30, 2011 and the current version is 1.3. The size of this app is of 0.9 MB. But let’s cut it out with the technical details of this app and let’s present more about the app itself. Unfortunately, I don’t possess an iPhone, but I can see what is the general opinion of the public related to this app simply by reading the reviews made by real users. And at the same time, I have the possibility of reading the description made by the manufacturer itself and also of seeing the screenshots presented also by the developer. The interface of this application or at least of the screenshot at which I’m looking right now is green and it presents a fruit at the top of the screen, some interesting facts in the middle and the possibility of sending the information that you received at the middle of the screen by e-mail, the possibility of commenting and others. 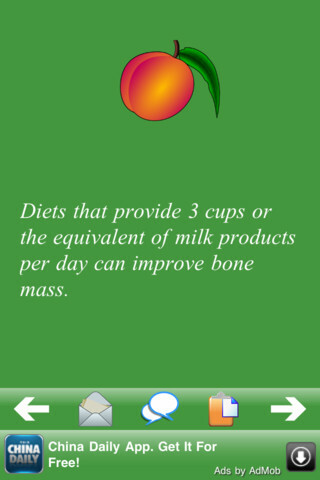 It is sad that if you drink 3 cups of milk every day, you can improve your bone mass. This is true even if you are a child or an adult. If you are a child, you need calcium in your bones and if you are an adult which is always in a hurry and which needs a lot of nutritional supplements, the calcium is very good for your bones also and for your entire health. And the best product of which I can think of right now (and I’m not influenced by the screenshot of this application) is the milk coming from a cow. There are some other animals, such as goats, that give you milk, only that the best milk comes from cows, not goats.